Home / Telangana Latest Updates / TS NOTIFICATIONS / TSPSC / TSPSC Notification 2017 – Apply Online for 2437 Posts-Degree College Lecture, Veterinary Assistant, Executive Engineers, Principal, Deputy Surveyors, Junior Lecturers, Principal, Inspector Of Boilers. TSPSC Notification 2017 – Apply Online for 2437 Posts-Degree College Lecture, Veterinary Assistant, Executive Engineers, Principal, Deputy Surveyors, Junior Lecturers, Principal, Inspector Of Boilers. 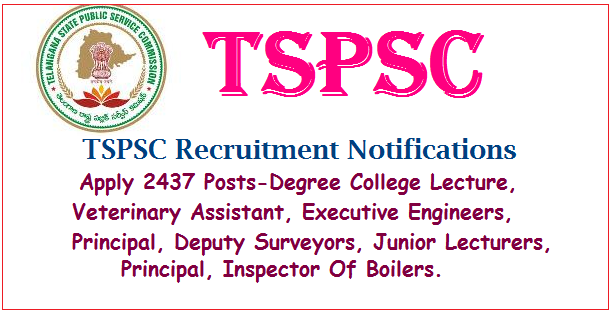 TSPSC Notification 2017 – Apply 2437 Posts-Degree College Lecture, Veterinary Assistant, Executive Engineers, Principal, Deputy Surveyors, Junior Lecturers, Principal, Inspector Of Boilers. On the occassion of Telangana Formation Day on behalf of Telangana Govt, Telangana Public Service Commission is going to issue Various Recruitment Notifications in Telangana. Definately its Sweet news for Eligible Aspirants. Intended Candidates with appropriate qualifications just they have to checkout for how many Recruitment Notifications eligible. TSPSC will notify all the issues related to the Recruitment Vizz... Eligible criterea, Scheme of Examination, Syllabus Schedule for the Recruitmnet process for the respective posts. Telangana State Public Service Commission is busy with preparation of Recruitment Notifications for 2147 Posts. The Notification may come with in a week.